The concept was simple… one click photo uploads directly to your media library without leaving WordPress – sounds good? Ya, I thought so, too. Instant Images is (most likely) the fastest and easiest way to upload high resolution, high quality and free photos from unsplash.com directly to your media library — all without ever leaving the comfort of WordPress! 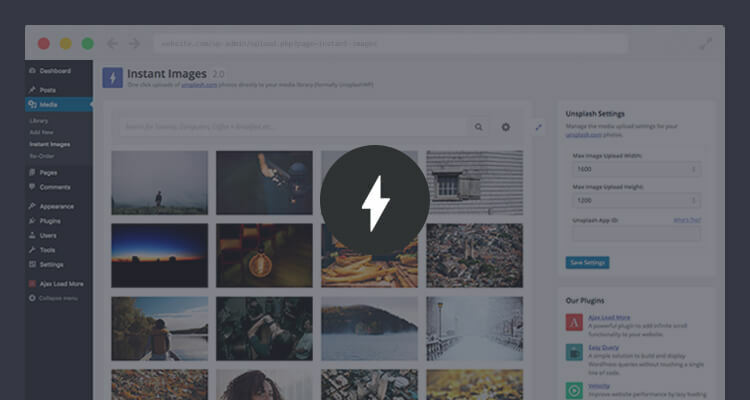 For the initial launch, Instant Images integrates with my favorite photo community, Unsplash, to bring their high resolution and ridiculous quality for free photos directly into your WordPress admin. Over time I’m planning to integrate with other services such as Pixabay and Getty Images. 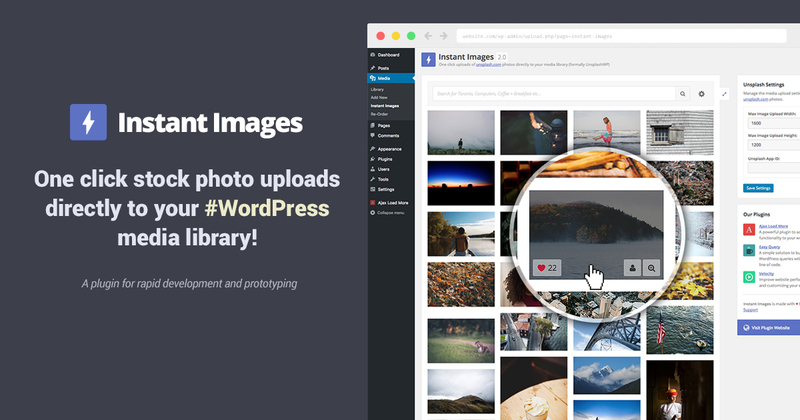 Instant Images is available now for download from the WordPress plugin repository. Save time and frustration by uploading photos to your media library by simply clicking an image in the listing. The Instant Images search functionality let’s you quickly find and upload images for any subject in a matter of seconds! The perfect tool for developers who want to prototype and develop using real world imagery. Images uploaded are automatically resized into the custom image sizes specified within your theme. Photo licensing can be confusing, costly and sometimes scary – the good news is all Unsplash photos are licensed under Creative Commons Zero, which basically means you can do whatever you want with them – perfect! Over the next few months I’m planning to get started on the following service integration’s and functionality. Unsplash Collection search and display. Upload and immediately insert into post functionality. Support for upload and selection from the featured image modal. I originally built Instant Images as internal tool for expediting the development of client and commercial themes – It’s already saving me time and I hope it will do the same for you. I only miss one thing, it’s the ability to access Instant Images directly in Post Edit mode. AFAIK, actually you have to go first to Medias –> Instant Images –> select and upload some pics to media gallery…and then you can write your post to include your selected unsplash pictures.